A7xpg and Parsec47 are two more superb "abstract shooters" from Kenta Cho, prolific Japanese freeware developer. If you have played rRootage or Noiz2sa (or hopefully both), you know what to expect here: two more insanely addictive shooters to add to your collection. Abstract, hypnotic, luminescent geometric shapes and frantic action will keep gamers glued to the screen. As to the games' mechanics, they're not quite of a piece, with A7xpg being different from most games Cho designed in the past: your job is to gather as much gold as possible while shooting enemy ships. You can become invincible temporarily by filling up the power gauge, and you do that by grabbing the gold at high speed. 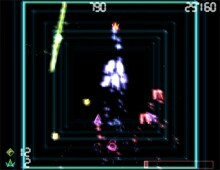 Parsec47 is similar to Noiz2sa in the clever use of abstract shapes and a random number generator to create a unique experience every time. An innovative feature is the tradeoff between power shot and speed: the only way to charge enough energy for the devastating "roll shot" is to slow down your ship. If you love shoot 'em ups, these are two more modern freeware gems that deserve to be in your collection. Two thumbs up, way up! Note: OpenGL is required for both games.